Several leaders in the city of Chicago joined forces to call on Gov. Bruce Rauner to sign a bill to license gun dealers in Illinois on Monday. NBC 5's Kye Martin reports. Several leaders in the city of Chicago joined forces to call on Gov. Bruce Rauner to sign a bill to license gun dealers in Illinois on Monday. Mayor Rahm Emanuel, Chicago Police Supt. Eddie Johnson, the Illinois Gun Violence Prevention Coalition, state legislators and advocates spoke at a news conference Monday morning in support of Senate Bill 1657, which passed the legislature in late February and awaits Rauner's signature to become law. Supporters of the bill, known as the Gun Dealer Licensing Act, say it would help deter straw purchasing and stem the flow of illegal guns into Chicago and across the state. SB 1657 would require criminal background checks for all gun shop employees, as well as training to help them identify a buyer who may be purchasing a gun for someone else. Several leaders in the city of Chicago planned to join forces to call on Gov. Bruce Rauner to sign a bill to license gun dealers in Illinois on Monday. NBC 5's Sandra Torres reports. The bill would also require basic store security measures to help prevent theft and require that anyone who sells, leases or transfers firearms in any way be licensed by the state. Emanuel initially sent a letter signed by all 50 Chicago aldermen to Rauner on March 2, asking him to sign the bill. 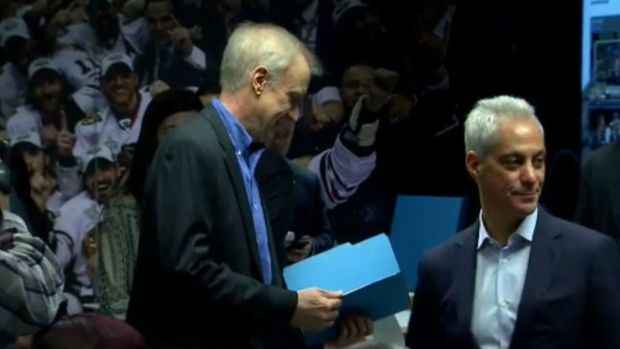 The mayor then handed Rauner a copy of the letter at an unrelated event on March 7, claiming that Rauner - facing a tough reelection battle - may not want to sign the legislation until after the upcoming primary election on March 20. Rauner evaded questions on the bill last week, saying he has been "crystal clear" in his stance. Mayor Rahm Emanuel hand delivered his letter urging Governor Rauner to sign stronger gun laws. The bills are on Rauner's desk but will he sign them before the march 20th primary? ] NBC 5's Mary Ann Ahern has the details. "I support bipartisan reforms to keep our citizens safer and we need to do this on a comprehensive basis. Real reform that will really change the system," Rauner said Wednesday. "Keep our students safer in our schools, ban bump stocks, support law enforcement and do a better job of keeping guns out of the hands of criminals and the mentally ill," he continued, adding that he looked forward to "talking with the mayor."